Toyota will start the 82nd running of the 24 Hours of Le Mans from the pole following an incident-filled final two rounds of qualifying Thursday at Circuit de la Sarthe. Kazuki Nakajima became the first Japanese driver to claim overall pole for the twice-around-the-clock endurance classic, taking his No. 7 Toyota TS040 Hybrid to a best lap time of 3:21.789. Nakajima’s flyer came early in the third and final qualifying session, which was extended to two hours and 30 minutes due to multiple red flags earlier in the evening. The Toyota driver improved on his 3:22.589 lap from Qualifying 2, which had put him on provisional pole. A handful of other drivers, however, also made improvements in the final session, including the No. 14 Porsche 919 Hybrid of Romain Dumas, whose 3:22.146 lap denied Toyota of a sweep of the front row. It marked the first pole for Toyota since 1999 and the first non-Audi in the top qualifying spot since Peugeot in 2010. Nakajima will share the No. 7 Toyota with Alex Wurz and Stephane Sarrazin as the FIA World Endurance Championship-leading team goes for an elusive first win at Le Mans. The No. 8 Toyota of FIA WEC points leaders Anthony Davidson, Nicolas Lapierre and Sebastien Buemi will line up third overall and in LMP1-H, thanks to a 3:22.523 lap time by Buemi, also set in the third session. Audi, which had claimed pole for the last three years, will start fourth, sixth and seventh after a turbulent past 24 hours, particularly for the defending race-winning No. 1 Audi R18 e-tron quattro of Tom Kristensen, Lucas di Grassi and Marc Gene. 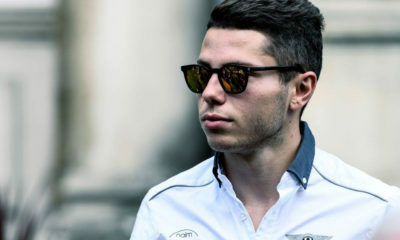 Gene was drafted in to replace 2013 pole-sitter and race winner Loic Duval following a massive accident for the Frenchman in practice on Wednesday, which destroyed the diesel-powered prototype. The German squad worked through the night to build up a brand-new car. However, the No. 1 entry had its share of dramas on Thursday as well, as di Grassi slammed into the barriers at Indianapolis in Q2 before nearly tangling with a LMP2 car, which spun and crash in avoidance of hitting the swerving Audi. Di Grassi, Gene and Kristensen will start seventh. Surprisingly, the quickest of the Audis was the No. 3 entry driven by Marco Bonanomi, Filipe Albuquerque and Oliver Jarvis in fourth. The No. 20 Porsche of Brendon Hartley, Timo Bernhard and Mark Webber, making his return to Le Mans since 1999, completed the top-five overall and in class. Rebellion Racing’s pair of new Rebellion R-One Toyotas will start eighth and ninth, with the No. 12 entry of Mathias Beche, Nick Heidfeld and Nicolas Prost nearly eight seconds off the pace of the pole-sitting Toyota. LMP2 pole honors went to Thiriet by TDS Racing in the race debut of the new Ligier JS P2 Nissan. Tristan Gommendy reeled off a 3:37.609 in the Onroak Automotive-designed prototype. The Frenchman’s time edged out the No. 38 Jota Sport Zytek Z11SN Nissan of Harry Tincknell by just 0.065 seconds. Gommendy will share controls of the brand-new cost-capped prototype with Pierre Thiriet and Ludovic Badey. The No. 35 OAK Racing Ligier-Nissan of Jann Mardenborough qualified third, ahead of the sister G-Drive Racing-entered Morgan-Nissan from Olivier Pla in fourth. Defending European Le Mans Series champions Signatech-Alpine completed the top-five in their Oreca-built Alpine A450b Nissan. The top-five in LMP2 were separated by less than one second. There were two significant accidents in the session, the first from the No. 29 Pegaus Racing Morgan-Nissan of Leo Roussel, who, crashed in avoidance of an erratic-driving di Grassi. Karun Chandhok, meanwhile, binned his Murphy Prototypes Oreca 03R Nissan at Indianapolis with less than 20 minutes remaining in Q3. The session went under the ACO’s new “Slow Zone” procedure and did not resume to full green-flag action.